This is my 7th world record. And that’s me! The year was 1997, and I was 40. Though rather beat up from my previous skydiving adventures, I did not hesitate for a moment to take part. 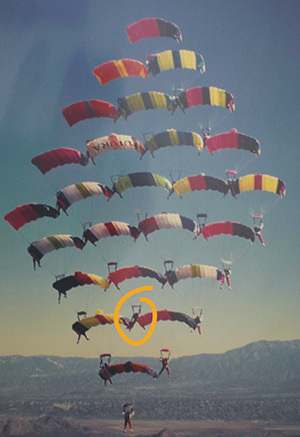 This kind of skydiving is called CRW or Canopy Relative Work (skydivers call parachutes “canopies”. ) The 25 participants on this dive are all women - and from all over the world. I remember the gal to my right was from Iceland! Though I was a highly experienced skydiver here, this was actually the first time I had been in a CRW formation this big, which made it quite exciting! To take part in this, we all had to jump these tiny, tricky parachutes. The opening shock was awful - followed by a “hard to pull off” landing. By the time we finished the world record (on the 25th try) my body was so beat up that I spent the afternoon in my hotel room throwing up. Would I take any of my skydiving career back? No. Even if I did get pretty beat up? Still no. It was all such a huge adventure. Of course, now I get to make up for all my past escapades. Hence The Wheeler Method, this website and my many efforts at relieving pain. PS - This record still stands. Amazing.